Some people died in the midseason premiere of The Walking Dead. One of those people was a small person. A child. This child was not, in fact, the first annoying kid The Walking Dead has brutally offed. 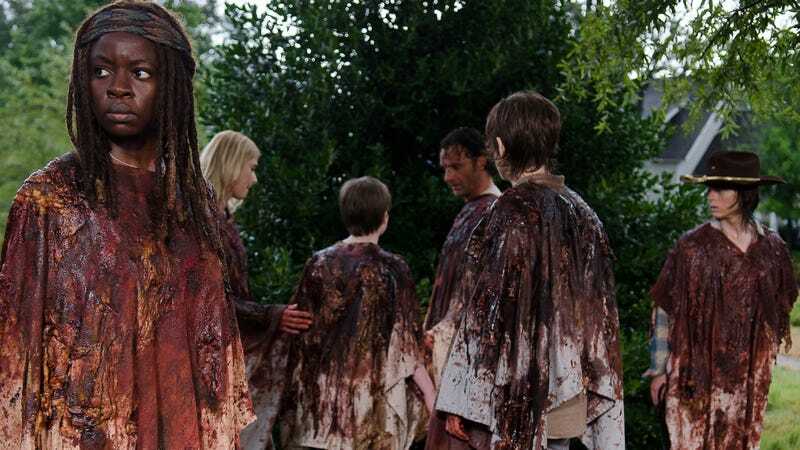 This episode provided somewhat of an emotional release for viewers who’ve been feeling anxious about the walker herd that threatened Alexandria for much of the season’s first half and then continued to roam the area after Rick’s failed plan to extinguish them. Before they all perished in a fire lake in one of the show’s worst melodramatic sequences, and we witnessed the deaths of two characters: the emotionally fragile Sam and his mom Jessie. Recall that at the end of the midseason finale, Sam (to our delight) screamed out “mom” while the gang was trying to escape a throng of walkers; it seemed like he was angling to get everyone eaten. Picking up where that finale left off, Sam is still unable to contain his emotions and false bravery, which led to his eventual death in this episode. The frustration of caring for a child (and thus the contextualized brutality against kids), it’s been proven, is amplified in a scenario where kids are guaranteed far less protection or promise of life—even the warrior Carl, who gets his eye shot out amidst the attempted breakout. The execution of Sam’s and Jessie’s death was ultimately unsatisfying (I also found the episode’s opening scene showdown nauseating). But Sam had to go.